Gun sales are at record levels. 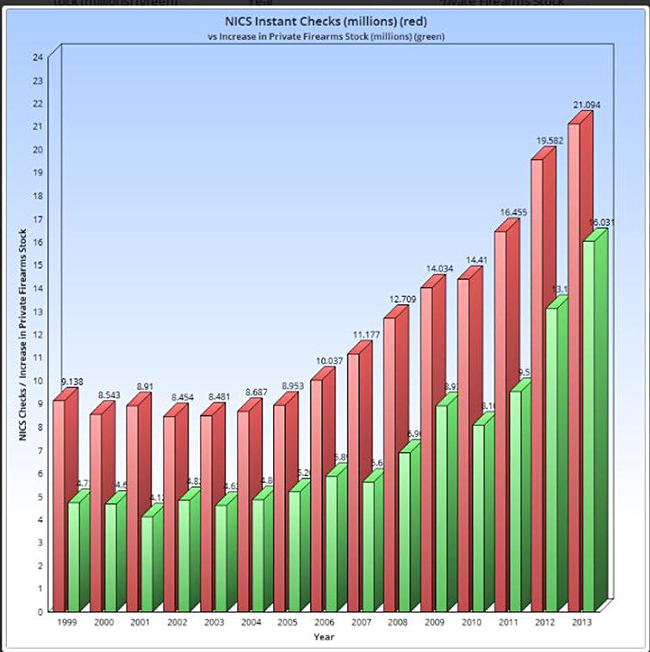 In the last six months, gun sales, as reflected by the National Instant Check system, have hit record highs for each of the six months. It is almost certain that 2015 will be the highest year on record for private gun sales in the United States. But when national polls ask how many households own guns, the numbers appear to be the same or dropping. How do we reconcile this seeming contradiction? The answer is likely in a Zogby Analytic question asked in February of 2015. But that number is just from the GSS, which reports the lowest number. Several other surveys report significantly higher numbers. In 2014, Gallup reported household gun ownership of 42%, and the ABC News/Washington Post poll showed the household gun ownership rate at 43% in 2013. If we use the 43% figure with the same percentage of non-responders as applied to the GSS survey above, the figure of households with a gun increases to 1.54 X 43% or 66%. The number of privately owned guns in the United States has more than tripled since 1970. It is on track to have quadrupled by the end of 2016. If we look at the GSS numbers of self reported individual gun owners, the same GSS survey that found 32% of households reporting gun ownership found 22% of individuals owning guns. Applying the same level of reluctance to report gun ownership to pollsters would mean that a minimum of 1.54 X 22%, or 34% of the population own guns, individually. Applying the individual ratio from the GSS to the other surveys would mean that about 44% of Americans individually own guns. It is easy to understand why gun owners would be reluctant to report gun ownership to a stranger who is writing down the information. Trust in the government is near all time lows. In those states that track the number of legal gun owners, the number of gun owners have increased dramatically in the last five years. In Massachusetts, the number of gun owners has increased 66% in the last five years; In Illinois, the number has increased about 75%, from a little over 1 million in 2010, to 1.8 million in 2015. In Massachusetts and Illinois, legal gun owners do not have the option to refuse to answer or lie to a pollster. If they want to legally own a gun, they have to put themselves in the government database. By definition, the numbers of legal gun owners in those states are reasonably accurate, and not subject to the under reporting that voluntary national polls suffer from. What are the actual numbers of individual gun owners in the United States? The number is unknown, and is likely to stay unknown. Given the results from above, it is between one third and one half of the population, or between 100 and 160 million people. Legal gun owners are potential voters. They are not felons. It is not surprising that legislation concerning guns, gun ownership, and gun use, is a potent political issue.